The first time I had lychee, I ordered it on a whim from a Thai restaurant. This was back when my husband and I were first dating–I had never had Thai food and I think I was trying to impress him by ordering something neither of us had heard of before. But wow, was I glad I ordered it–it was so sweet and fragrant, almost like candy. Lychee is now one of my favorite flavors, but unfortunately, it’s rare outside of Asian markets and restaurants. I had an extra lime from another recipe this week, so I used the juice from that in the popsicles too. And since my basil plants seem to be growing several inches a day, I made a basil-flavored syrup to mix in as well. These turned out exactly like I thought they would–a perfect mix of sweetness from the lychees and the tartness of lime juice, with a hint of fresh basil. 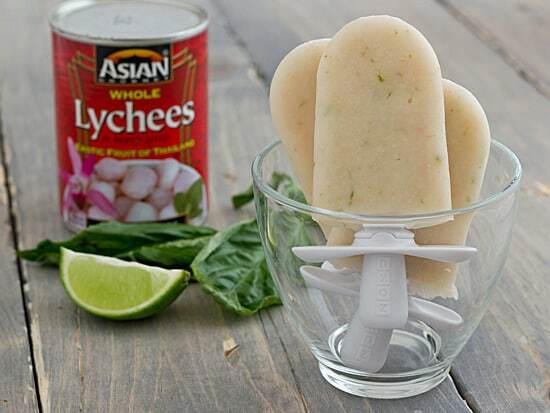 Lychee, basil, and lime? Yes! They go together perfectly in these popsicles. Combine water, sugar, and basil leaves in small saucepan. Bring to a simmer over medium heat. Remove from heat and cool to room temperature. Pour basil syrup through sieve into blender or food processor. Discard basil. Add lychees, lime juice, and zest and blend until smooth. Pour fruit mixture into popsicle molds. Freeze until solid. This seriously looks amazing! I love Thai food, and I have got to try these now! I've heard of lychee but don't know what it is. The popsicles sound really good and exotic though. You're so creative! I don't think I've even tried lychees before. I'll have to look for them. If you can not get whole Lychees this can be done with Lychee juice (50% juice/50% water) but do not add the water or sugar since it’s already in the juice. I’d use two or three cans depending on your ice cream makers capacity. The juice does not have all the bulk of the whole fruits pulp, etc. so you end up using the same amount as you would with whole lychees but just do not add water. Also heating the lychee juice with the basil and zest will help since it will reduce once boiling and cooling so you end up with a density closer to the original recipe. If making a sorbet instead just use more water (not needed if using the juice version instead) and a teaspoon of vodka to get the right textural consistency. I tried a savory recipe version once (Perilla) and it did not work. Stick with the fresher lime and basil flavors posted here. Lemon would work as but lime is much better. You can also use lavender instead or in addition to the Basil but use only 1/2 teaspoon or it will be cloying not subtle, floral and sweet. This is a good recipe to double and save time. Also, if the leaves are smaller double the amount to a dozen.